Victorian medic Mike Ray was called to help a man who was attempting suicide by entering the sea. His efforts, as well as those of his partner and police, were successful and the man was saved. “As a Paramedic, we occasionally find ourselves in unpredictable situations, helping people in their hour of most need. Sometimes they realise this, sometimes they do not,” Mike said in a public post on Facebook. 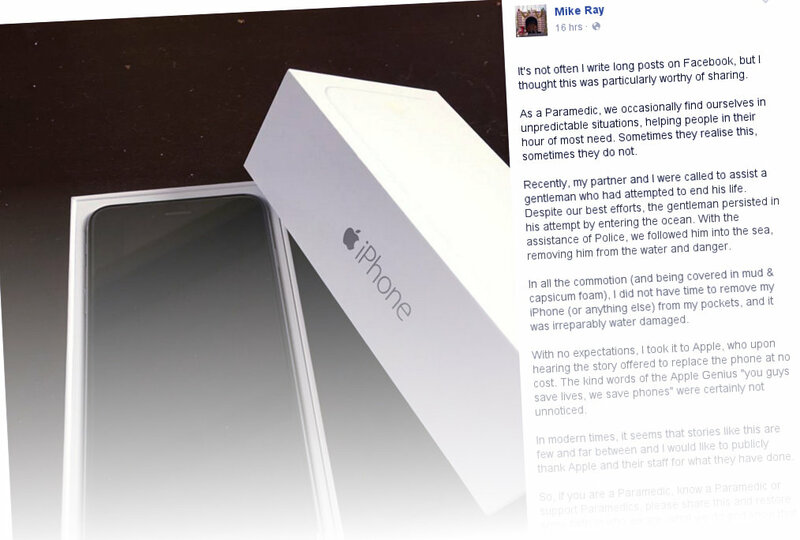 “In all the commotion… I did not have time to remove my iPhone, or anything else, from my pockets, and it was irreparably water damaged. “With no expectations, I took it to Apple [in Narre Warren], who upon hearing the story offered to replace the phone at no cost. I rarely write posts like this and am far from a fan of Apple’s products, but that is not the point of sharing this story. The gesture of the staff who handled Mike’s replacement is a strong one, and hopefully sets a precedent for successful businesses giving back to their communities. Now if only Apple would pay its taxes we could better fund our support services. A free phone is great and has made a positive impact in one lifesaver’s world, but we cannot let that gloss over the billion-dollar multinational’s cheating of the Australian people. If you or someone you know is having difficulties with depression or anxiety, you can contact Beyond Blue on 1300 22 4636 or at www.beyondblue.org.au for support and advice. Being an Apple fanboy, may I point out that Apple *does* pay its taxes (even according to the article you linked to!). It just uses legal methods (loopholes not ‘cheats’) to pay the least amount possible: like pretty much all Australian companies & individuals. Or do you pay extra tax because you think Australia deserves it? Let’s be accurate and place the blame on governments that allow these practices to exist, and not passively incite fanboy flame wars. BTW: I totally agree that Apple (and Microsoft, Samsung, HP, HTC, Google, etc …) *should* be paying more tax in proportion to their revenue. Let’s lobby to pollies to change the laws so these companies do so. Haha, correct. It is intentional tax minimisation through moving profits offshore. It’s legal but I would not say it’s ethical. To put it in a different perspective: Let’s say you’re a shareholder in KulichCorp, and the board says “We’re going to use the totally legal “Irish Double Sandwich” technique to minimise our tax expenditure, and maximise shareholder returns”. What do you think your fellow shareholders will say & do?